A. I. S. series is an archive for structural drawings created for existing structures, which lack bureaucratic or official status. 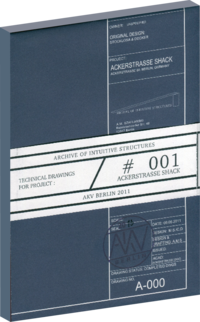 Edition # 001 contains 9 technical drawings for a structure found in Wedding, Berlin. Drawings are to be by the terms specified on the drawings. Re-build at your own risk.